It was during Medieval times that the use of glass was first experimented with – being widely used as a decorative feature, and not just as a means of letting light in. The architectural trend of Gothic churches encouraged the use of stain-glassed windows to illustrate biblical scenes, helping to set a future trend for the transparency and luminosity of glass. However, it was not until the industrial revolution that there were substantial advancements in the production of glazing materials; large sheets of glass, as well as the introduction of new construction materials, were beginning to be manufactured, allowing for larger glass façades to be held in place. These developments opened up numerous possibilities to using glass in construction and it was during this time that architects first trialed designs that included glass conservatories, and entire walls of glass. 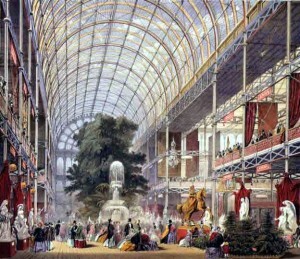 One of the earliest and most famous examples of such a large scale glass project is The Crystal Palace, built in 1851, and consisting of 300,000 panes of glass. This iconic building helped encourage architects to be more inventive, paving the way for an increased amount of glass used in architecture. Further to this realisation, another important change during the later part of the century was the change in the structural use of glass. Instead of glass being used as a material to open up a structure, it could now be used as the material for the structure itself. The development of glass skins and suspended glass techniques during the 1960s led to the construction of larger steel structures, which supported skyscrapers built of pure glass walls – helping to create the city’s skylines we see today. Modern day innovations in glazing solutions and glass technology are continually opening up new doors for the way glass can be used in architecture – in both commercial skyscrapers as well as the home. The combination of various glazing solutions can lead to many benefits – and most recently is even assisting in the energy efficient movement – helping homeowners save on energy bills. Pilkington has led the way in innovation for over 180 years – developing a numbers of glazing solutions, including self cleaning, thermal insulation and noise control for example. For information on the full range of the glazing solutions Pilkington offers, as well as the benefit they provide, please visit our website.